Volunteering is one way to make a real difference! From helping your local community to bettering conditions across the globe, you can positively impact people by offering your time and creativity to ACNM's cause. Gain new experiences and insights, make meaningful connections, and build essential career skills just by giving back to others! One unique aspect of the American College of Nurse-Midwives is its vast array of opportunities and positions available to all potential volunteers. Much of the organization's successes and victories derive from the efforts of volunteers who span across the United States. advises the Board on matters pertaining to personnel, administration, staffing and benefits. Division of Advocacy and Affiliate Support enables a legislative and public policy environment that supports the unencumbered practice of midwifery by CNMs and CMs to the full extent of their education, training and experience; to increase consumer awareness, understanding, and use of midwifery and midwives; and to strengthen and support ACNM's state affiliates. increases general Affiliate member numbers, diversity, engagement, and satisfaction. Division of Membership and Publications provides overall direction and facilitation for ACNM Membership and Publications functions through working with committee chairs and members from the following groups: Clinical Standards and Documents​, Diversity and Inclusion, Membership and Marketing, Midwives of Color, Publications, and Students and New Midwives​. maintains a list of midwifery history sources; works with the affiliates to help preserve midwifery history at the local level. Division of Global Engagement works to spread the interest and expertise of ACNM members across the world. To support global engagement through information exchange and increase midwives' general knowledge about midwifery, the Division actively promotes the understanding of the reciprocal benefits of working with diverse communities on a global level. In partnership with ACNM, the DGE also offers venues for sharing global health and midwifery information, as well as extensive research to increase the number of global ACNM participants. DGE further maintains effective and up-to-date communication to help engage, educate, and connect ACNM members interested in global midwifery through networking, research, education, communication, and guidance on global health competencies. 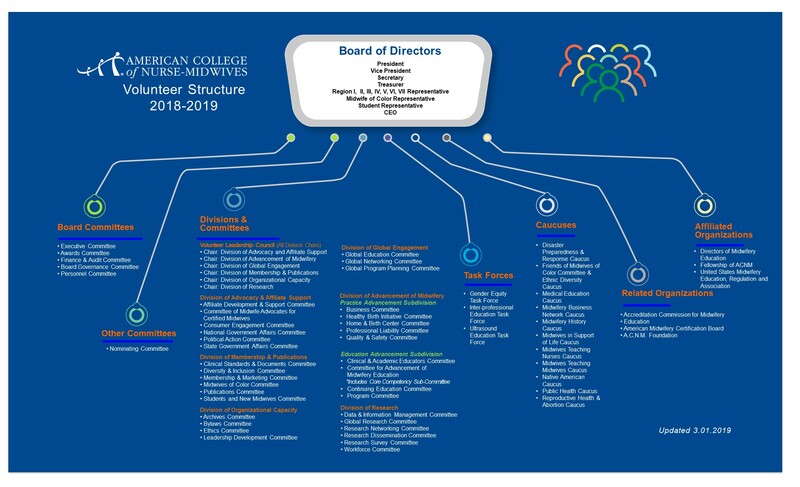 The Practice Advancement Sub-division strengthens the profession of midwifery in the United States by assisting midwives in establishing Boards of Midwifery, supporting midwifery as a distinct profession welcoming of diverse backgrounds, and encouraging more individuals to aim for CNM/CM credentials. The Education Advancement Sub-Division establishes and updates educational resources to properly prepare nurse-midwives, determining the activities that classify competency in nurse-midwifery and developing criteria that allow an individual to demonstrate such competency. The Sub-Division furthermore delineates and implements the process for practicing nurse-midwives to remain up-to-date in skills and information. This Sub-Division comprises of the following sections: Clinical & Academic Educators, Advancement of Midwifery Education, Core Competency Task Force, Continuing Education, and Programs. Division of Research further advances the profession of midwifery by promoting the development, dissemination, and implementation of research. DOR is inspires, conducts, coordinates, and links research activities within the ACNM, as well as with other national and international midwifery research organizations. The Division further nurtures the research interests and abilities of ACNM members, fostering communication among midwifery researchers, clinicians, the media, policy makers, health planners and funders. The DOR advises the ACNM about research issues including membership surveys, research priorities, and evaluation of research proposals that require ACNM endorsement or support. encourages the development of Practice Based Research Networks (PBRN). Task forces are groups of members that are assigned very specific and defined tasks under the direction of appropriate committees. These groups generally report directly to their respective overseeing committee. Gender Equity Task Force investigates simulation, didactic material, clinical experiences, and areas for curricular sharing that can be incorporated into student midwives’ and obstetrical residents’ educations. Interprofessional Education Task Force develops instructional, simulative, and clinical opportunities for midwifery students and obstetrics-gynecology residents to work together as learners in joint ACNM and ACOG partnerships. Ultrasound Education Task Force facilitates coordination between the Board and membership with national organizations that develop standards of practice which include midwifery providers with the distinct scope of ultrasound use for midwifery practice. These are groups that aim to provide fellowship, support and networking opportunities on topics of interest. Disaster Preparedness and Response Caucus: Also called the “humanitarian space,” this caucus maintains professionalism, coordination, and accountability in supporting ACNM members’ desire to participate in disaster preparedness and response activities. Friends of the Midwives of Color Committee & Ethnic Diversity Caucus: Dedicated to assisting the Midwives of Color Committee, this caucus works to promote and increase ethnic diversity among midwives. Medical Education Caucus: As ACNM members who aspire to enhance medical education, this caucus actively promotes the role of midwives in the field by encouraging normal pregnancy and birth in a woman-centered philosophy. Midwifery Business Network Caucus: This caucus examines the business needs of the membership. Midwifery History Caucus: This caucus maintains and preserves historically significant material for reference by ACNM members, midwifery students, and individual researchers approved by the Board. Midwives Teaching Nurses Caucus: This caucus shares best practices, recommended texts, and other teaching tips for midwives who teach undergraduate nurses. Additionally, members of this caucus present at the ACNM Annual Meeting, highlighting the importance of this professional role for midwives. Midwives Teaching Midwives Caucus: This caucus acts as a venue where midwifery educators share information, learn from each other, and participate in problem-solving and professional growth. Native American Caucus: This caucus offers a place for anyone interested in the work of midwives in Indian Country or Alaska, or in the health and well-being of Native American women and mothers. Public Health Caucus: This caucus is a forum for midwives with public health backgrounds or relevant interests to connect, exchange ideas, affect policy, and promote the education of the general membership surrounding such issues as interpersonal violence, STD screening/treatment, care of the HIV-infected woman, and other diverse public health topics that members of the caucus find appropriate.